I mean, of course this was going to be on the list. We’ve seen really strong, and really weak goaltending from both Tuukka Rask and Frederik Anderson over the past two series. Outside of a softy or two from both guys, the two have been really solid throughout the first six games of this series. Rask has a .921 save percentage with a 2.54 GAA and Anderson has a .925 SV% and a 2.70 GAA. With the potency of both offenses and some questionable defense by both teams, I can’t see this being a 1-0 game. There will be goals, it’s just a matter of who can make the saves when it matters. Can the Offensive Stars Produce? The superstars on both sides have been very on and off all series. Austin Matthews has lead the way for Toronto, scoring five goals in the six games (but in all honesty, hasn’t really dominated at any point). 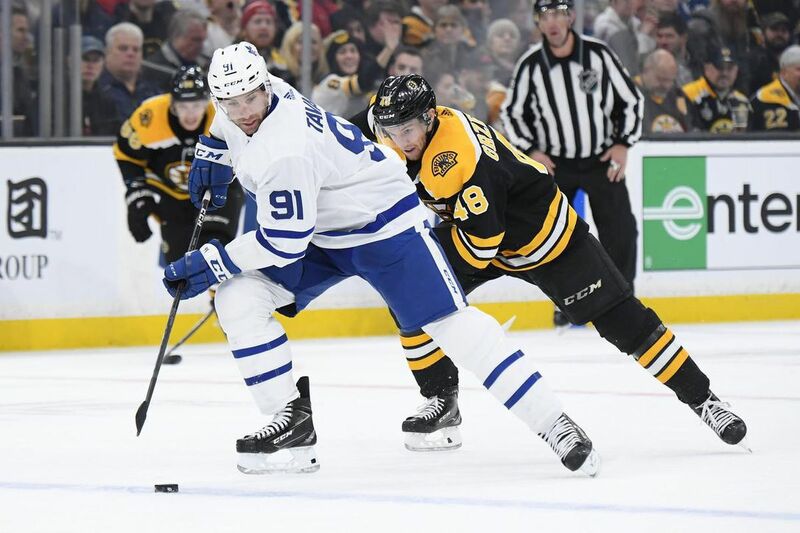 The Bruins top defensive pair of Charlie Mcavoy and Zdeno Chara have done an excellent job shutting down the John Tavares and Mitch Marner line, but with all of that talent, how long can that last? The trio of Patrice Bergeron, Brad Marchand and David Pastrnak have been very streaky throughout the series for the Bruins. We all know how dangerous they can be when they’re on their game (they all absolutely torched the Leafs last series) but something has been off with them this series and for the Bruins sake, that better change. We’ve seen how important special teams have been in this series and throughout the entire playoffs. The Nashville Predators just fell to the Dallas Stars, largely in part to their horrendous powerplay (going 0-15 in the series). Boston and Toronto both have very good powerplays, with Toronto converting on 21.4% of their PP chances and the Bruins scoring on a staggering 43.8% of their chances. There’s no question the game will be a chippy one and I’d assume the referees arms will stay down for most of the game, but when a penalty is called, converting on that opportunity will be huge. In Game 7 last year, the Bruins hard-nosed forechecking was a big reason why they were able to come back and take the lead late. 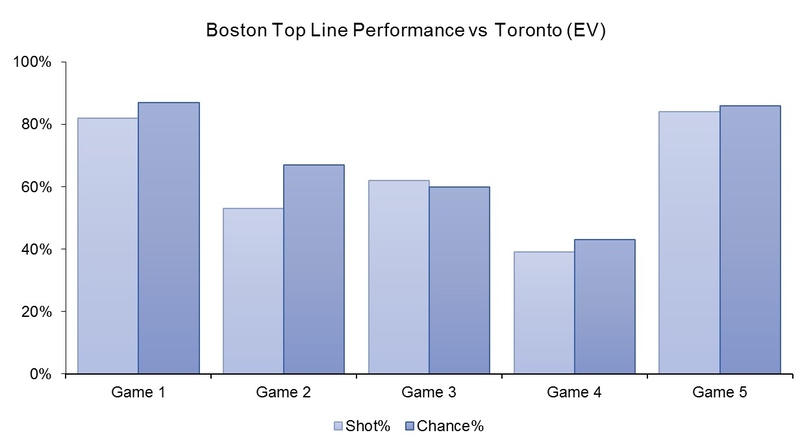 In the games the Bruins have lost this series, they haven’t been able to maintain consistent pressure in the Leafs zone. The Maple Leafs defense is very susceptible to making mistakes with the puck when pressured so that needs to be the Bruins #1 priority throughout this game. Forechecking obviously isn’t just a component of the Bruins game, it’s just as important for the Leafs to keep the pressure on the Bs. Putting pressure on smaller guys like Torey Krug and Matt Grzelcyk will be huge for the Maple Leafs, they’re easier to out-muscle compared to the rest of the d-core and getting them to cough up the puck will lead to big-time chances for Toronto. Isolating Zdeno Chara is also just as key, as he certainly doesn’t have the legs to keep up with Toronto’s speedy forwards. Depth scoring is a key component of every single game and it’s just magnified in the playoffs. Guys like Charlie Coyle and Andreas Johnsson (who both have had very strong series) have key roles with their respective clubs. If the big names aren’t able to step up, look for these middle-six guys to pick up the slack. Scoring the first goal is massive, but keeping that lead is even more important. The team that has been ahead going into the third period has won every game this series and with every player fighting for their playoff lives, there’s sure to be a lot of pressure on both sides of the bench. 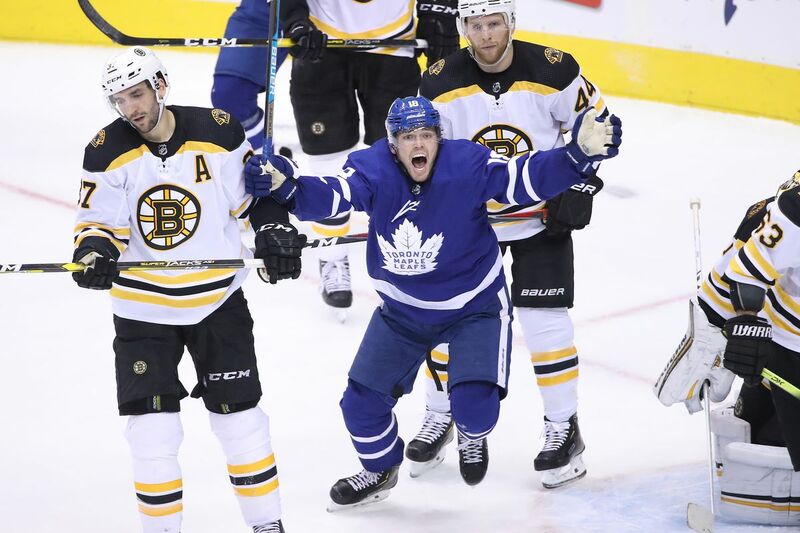 Looking at the history between these two teams, the Maple Leafs have held the lead going in to the 3rd period in the past two game 7s, but have lost both after outstanding comebacks by the Bruins. If the Maple Leafs or the Bruins want to get to the next round, maintaining a lead will be the reason they get there. Despite having a combined -10 rating in the series, Nikita Zaitzev and Jake Muzzin have done a pretty good job at keeping the Bruins top line in check. Unlike last series, the Bruins top line hasn’t been nearly as good. They haven’t been able to maintain possession of the puck quite as much and their cycling game, which leads to the majority of their chances, is nothing like it has been all season long. If Toronto wants to keep this line at bay, trying to keep this matchup will be their best bet. As I said before, Mcavoy and Chara have done an excellent job holding Tavares and Marner to minimal offense in this series. With last change and home ice advantage, coach Bruce Cassidy will have to be on his game to keep the matchups in he wants throughout his lineup. Regardless of the outcome, this should be a great game as it always is. I’ve had Bruins in seven from the start and I’m sticking with that pick. Go Bs. The narrative for the Bruins over the past few seasons has been a significant lack of depth scoring. In last years playoffs, the Bs were lead by the trio of Brad Marchand, Patrice Bergeron and David Pastrnak who combined for a staggering 16 goals and 53 points throughout the Bruins first two rounds. Following the first line, David Krejci (10 points) and Jake Debrusk (eight points) both had solid playoffs but after those five forwards, the next highest scorer was Rick Nash who had a measly five points and a -7 rating. The lack of depth was the downfall of the Bruins in last years playoffs. In last year’s first round, the Bruins top line was incredibly dominant and the graph above shows just that. For reference, anything over 50% was in the Bs favor so yea, the line was incredible all series (Bergeron was hurt game four). In game five (which the Bruins actually lost) the Bergeron line outshot Toronto 31-6 (84%) and out-chanced them 18-3 (86%). That dominance was the main reason the Bruins were able to make it past the Maple Leafs last season. This is a new year, and a new Bruins team. The Bruins AREN’T relying solely on their top line. Their third unit has arguably been their best line this entire series. Charlie Coyle has shown why he was so popular in Minnesota and has impressed all of Boston with his strong play the series. 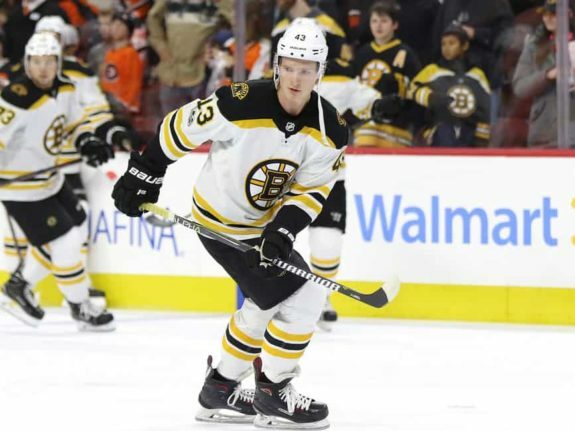 Danton Heinen hasn’t slumped as he did last playoffs with a goal and two assists in five games and Both David Backes and Karson Kuhlman have played pretty well, giving the Bruins a legitimate 3rd line unlike last playoffs. Despite the strong play of the 3rd line the Bruins are still down 3-2 in the series. What was most apparent after their 2-1 loss to the Leafs on Friday was the lack of dominance, or dare I say it, poor play shown by the 1st line. Playing primarily against the line centered by John Tavares and the pair of Jake Muzzin and Nikita Zaitzev, the “perfection line” has been far from perfect. The trio has scored just three even strength goals this series and, especially in game five, have really struggled to generate offense. 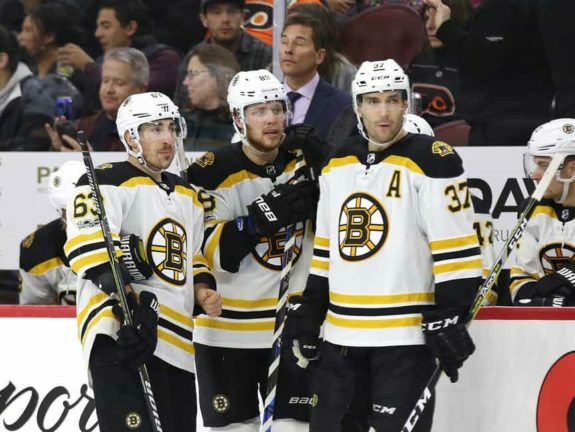 After the line was stymied again in game three, Bruins Coach Bruce Cassidy said “they’re having a tougher time getting to the net, and as a result I think they’re trying really hard one-on-one to get there. I think they need to use each other a little bit more to get there. [Maybe] get an old-fashioned goal whether it’s a center lane drive, a puck to the net or a second chance. They’re pretty determined guys.” While the line bounced back to have a solid Game Four, it clearly didn’t carry into Game Five. Like Cassidy said, the line just needs to simplify their play. I’ve seen Marchand and Pastrnak carry the puck into the zone and attempt to finesse through three Toronto players too many times. 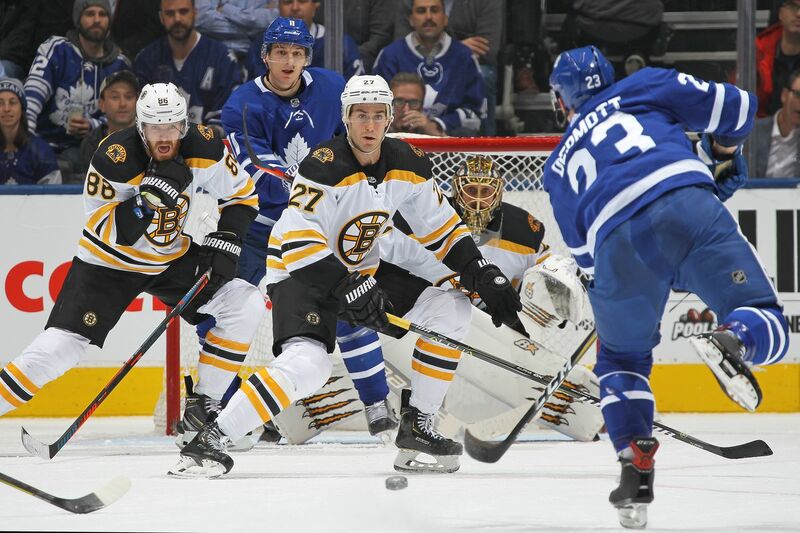 The line is just too good to continue to get stifled by the Leafs D.
In the three Bruins losses this series, the Bergy line has scored once, which was a powerplay goal in game one. Maybe Bergeron is playing through an injury and Pasta’s hand is still not fully recovered but a line consisting of an 100 point player, a four time Selke winner, and a guy that was on pace for 45 goals this season shouldn’t be struggling this much, especially against a team that they have all had incredible success against in the past. Now it’s do or die for the Bruins and their 1st line. The Bergy line MUST come out strong and replicate the success they were able to sustain in last years matchup. If they continue to play poorly in the 1st period, Cassidy needs to do his job and break them up, there’s no more time to wait for them to produce, it’s now or never. Maybe Danton Heinen or Marcus Johansson find their way to the first line or maybe David Krejci, who played incredible with Marchand and Pasta when Bergeron went down with an injury, slides up in the lineup. It’s time to see why this has been the best line in hockey over the past two years. The big man isn’t retiring anytime soon. The Bruins have announced that they have re-signed defenseman Zdeno Chara to a one-year deal worth $2 million with another $1.75 million in performance incentives. He will receive $1.25 million at ten games, $250 thousand for making the playoffs and another $250 thousand for winning the Stanley Cup. Even at age 42, the future Hall-of-Famer is still having a very productive season. 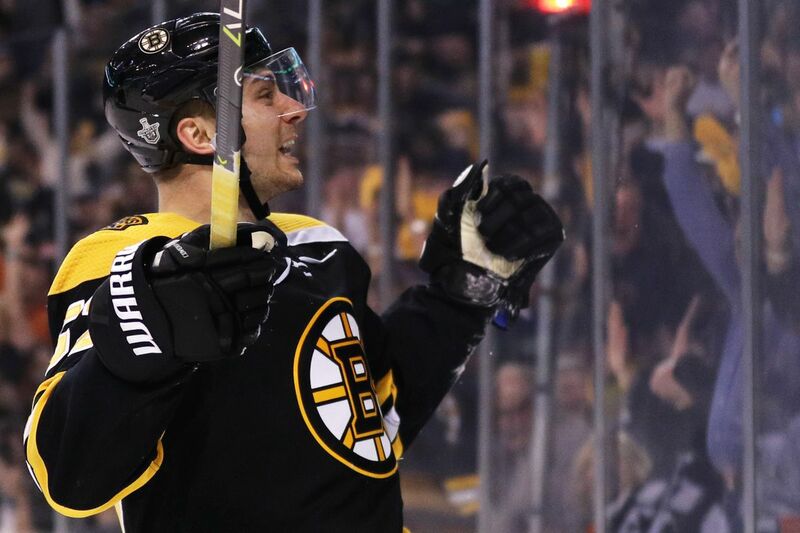 In 55 games this season predominantly featured on the top pair with Charlie Mcavoy, Chara has scored four goals and tallied seven assists to go along with a plus 16 rating. He continues to be great in the possession metrics as well with a 53.7 CF% and 54.7 FF%. He’s a huge asset to Boston’s 10th-ranked penalty kill and continues to be an incredible leader on, and off the ice. Chara was originally drafted by the New York Islanders in the 3rd round of the 1996 NHL Draft. Crazily enough, there’s actually another active player from that draft in fellow 42-year-old Matt Cullen (the only other player older than Chara). In 2001, Chara was apart of a massive trade with the Ottawa Senators that sent Bill Muckalt, the 2nd overall pick in the NHL draft (which was used to draft Jason Spezza) and Chara for Alexei Yashin. In 2006, the Bruins signed then UFA Chara to a massive deal for five years at $7.5 million per year. Chara continues to amaze after 21 seasons in the NHL. He is immensely important to this Bruins team. 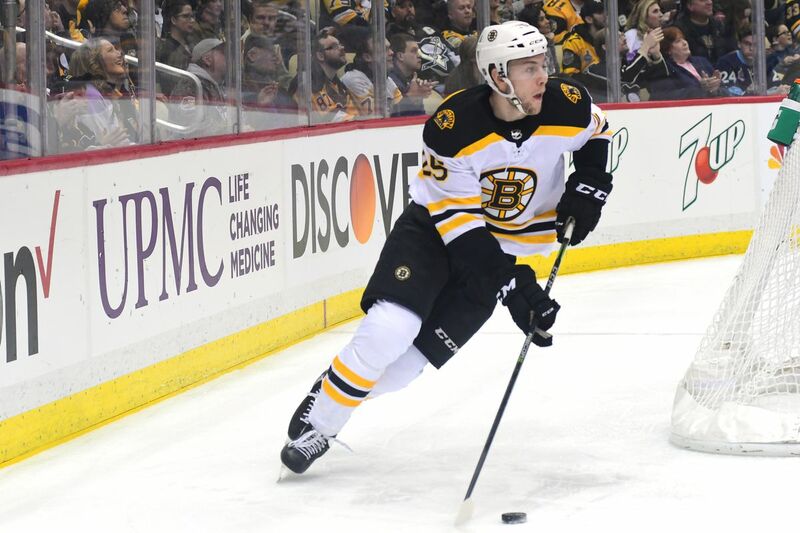 He’s proven to be an incredible role model to the entire Bruins organization, but especially to the growth of the crop of young d-men, the Bruins have, namely Charly Mcavoy. There’s no questioning if the Slovakia-native will be Hall of Fame bound. Chara has been in the top five in Norris Trophy voting eight times, capturing the award in the 2008-2009 season. He set a career high of 19 goals that season and was a plus 23 in 80 games. He, of course, doesn’t just have regular season success. 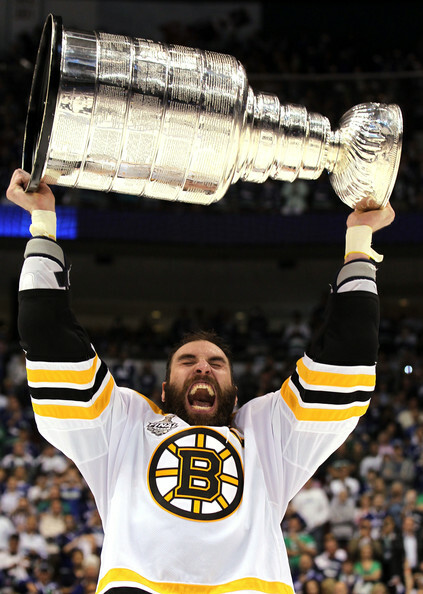 He led the Bruins to their first Stanley Cup in almost 40 years in 2011 where he was a league-leading plus 16 and was on the ice for almost half the game, averaging 27:39 minutes of ice-time a game. He was a hug factor in the Bruins 2013 cup appearance where he actually averaged even more ice-time than the previous cup run at 29:32 a game and tacked on 15 points in 22 games. While his legs have slowed down, this deal is still a bargain for the captain. He continues to be the heart-and-soul of this Boston team, and it shows how much he values the team in this deal. While the thought of Chara leaving is unfathomable, he certainly could’ve gotten a bigger deal due to his importance to the roster. His small cap hit allows the Bruins to allocate more of their cap to their upcoming RFAs with Danton Heinen, Brandon Carlo, and Charlie Mcavoy all looking for significant raises next season. The man just never ceases to amaze and will stay the “C” of the black and gold for at least one more run. What Will The Bruins Forward Lines Look Like With Pastrnak Healthy? These were the not-so-impressive lines from when the Bruins played the Sharks on February 18th. 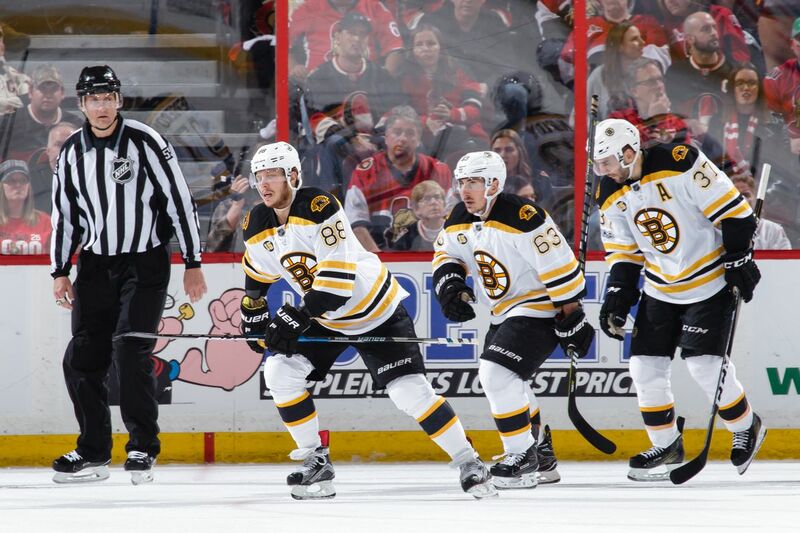 The Bs still managed to get a big win (albeit controversial) with this group of forwards. In a few weeks, the Bruins will have their all-star forward back in David Pastrnak. Pasta, along with the trade-deadline additions of Charlie Coyle and Marcus Johansson will make the Bruins forward depth incredibly deep and dangerous. The question remains still, what does this lineup look like with a healthy roster? There’s a lot of things to take into account. 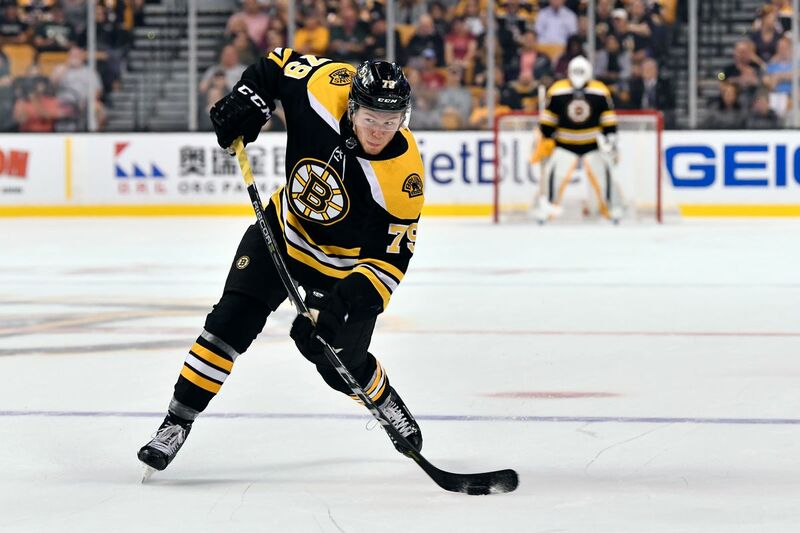 Could Pastrnak slide back in on the 2nd line with Jake Debrusk and David Krejci? Johansson seemed to have immediate chemistry in his first game with Krejci and Debrusk on the 2nd line. 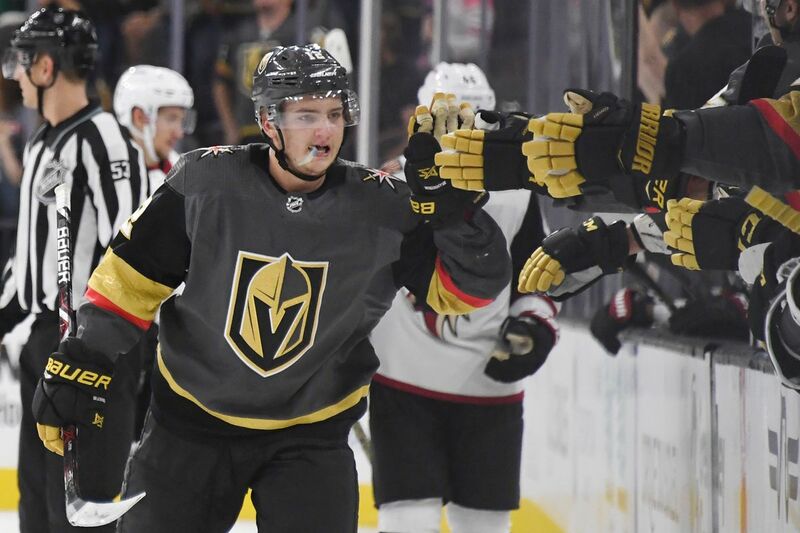 He played very well, and that line generated a lot of really good scoring chances throughout the game, including a pretty tic-tac-toe goal from the trio. If that line continues to gain more chemistry, it’s probably worth keeping them together. Maybe Cassidy decides to reunite the super-line. Obviously, the combination of Marchand, Bergeron, and Pastrnak is arguably the best line in hockey but with Danton Heinen finally finding his game and the 1st line still producing at a high level, it would be interesting to keep the line together and try out Pastrnak on the 3rd line. Pastrnak on the 3rd line? How do can you put a PPG player on the 3rd line and still expect him to produce? Well, a man by the name of Phil Kessel did that and look where it got the Penguins. The notorious HBK line consisted of Carl Hagelin, Nick Bonino, and Kessel, and was a huge reason why the Penguins were able to win their 2016 Stanley Cup. The ability to have three lines that can score at will is very hard to come by, especially in the playoffs. It’s very likely the Bruins will end up playing the Toronto Maple Leafs in the first round of the playoffs. The Leafs also tout a very effective 3rd line, with former 30 goal scorer, Nazim Kadri centering rookie Andrea Johnsson, who has 19 goals and 36 points in 56 games and William Nylander, who’s coming off of back to back 61 points years. I’d say a line of Pastrnak, Charlie Coyle and David Backes (who looks a lot better playing with Coyle) would be a match-up favorable to the Bruins. With that top 9, and a 4th line that coach Bruce Cassidy can throw out against almost any other line, Cassidy can pick and choose his match-ups and expect great results. There may not be a deeper forward group in the NHL. In all honesty, I think Cassidy will end up resorting to putting Pasta back on the top line, but I really do think it’s at least worth a shot to test Pastrnak on the third. Even with the super-line, Cassidy can just pick and choose who he wants in the lineup. They have so many options with the additions at the deadline. Coyle can end up playing with Krejci or continue to play well at 3C. Johansson had a lot of success in Washington with Nick Backstrom and Alex Ovechkin, so maybe he’s another guy to try out on the top line. Rookie Karson Kuhlman and Peter Cehlarik both looked at home in their handful of games with the Bruins and played on the 2nd and 3rd line but look to be healthy scratches as of now. Even Joakim Nordstrom has seen looks all throughout the lineup this year and continues to be a speedy, defensively reliable player. The Bruins have options galore. Now at the end of the day, whatever group of forwards the Bruins throw out will be a really good one. The acquisitions at the deadline give this team a brand new feel and make them a real Stanley Cup contender. Oh boy, are playoffs going to be fun. Bruins 4th Line, Merlot 2.0? 4th lines across the NHL have changed quite a bit over the recent history of the NHL. The 4th line used to always be full of grinders and guys willing to drop the gloves. They didn’t play as much, but would always be a highly physical group of players that would change the tone of the game immediately. While some of that stays true today, a look around the league’s 4th lines would show that the 4th lines of old don’t rear their heads much in the NHL now. One big exception to that is the 4th line of the Bruins, the “WAK” line consisting of Sean Kuraly, Noel Acciari, and Chris Wagner. While the trio hasn’t been together all season long, their recent stretch of play has raised a lot of eyebrows and getting them the greatest compliment they could ever receive, do we have a new Merlot Line? The Bruins Merlot Line boasted three absolute fan-favorites that put together an instrumental part of the Bruins Stanley Cup runs a few years ago. Left-winger Daniel Paille was a skilled, speedy winger that was a tremendous fore-checker. Shawn Thorton was an incredible leader both on, and off the ice. He was never afraid to stick up for a teammate but also had a lot more talent than people gave him credit for. Gregory Campbell centered the two and might be the toughest player I’ve ever seen play. He didn’t drop the gloves quite as much as Thornton (as if anyone did) he was just incredibly hard-working and again, had more skill than many thought. Also, who can forget when he finished a shift after breaking his leg. 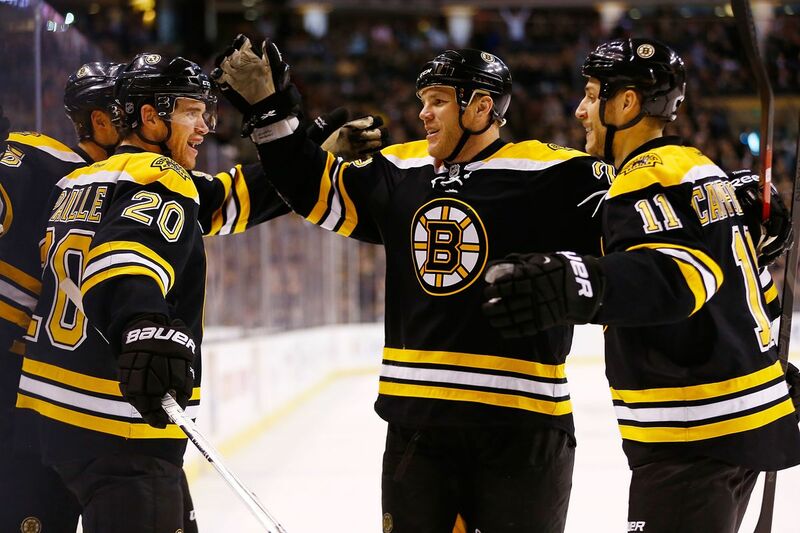 This trio combined for 29 goals in the 2010-2011 season (with Paille missing half the season) and continued to play a very important role throughout the Bruins Stanley Cup winning season. I’ve seen a lot of striking similarities between both 4th lines. The current “4th line” now has honestly been by far from just a 4th line. While the tendency to fight has gone down considerably in the league, all three guys are willing to chuck em’ to give the team some energy but again, they aren’t just a typical energy line. Coach Bruce Cassidy often has them playing against team’s top lines and they continue to do nothing but impress. One reason why the line has been really successful is one that you might not think to be all that important. All three members have played a lot of center in their careers, which is huge considering they start over 67% of the time in the Bruins’ zone. If one gets kicked out during a big defensive zone faceoff? Another member (well both actually) can come in and take it, rather than forcing a winger to do something unnatural to them. All three are usually relied upon to kill a lot of penalties as the second unit and have done a good job at that as well. They’ve helped the Bruins have the 12th best penalty kill in the league at 80.7% and is only 1.7% behind the 5th place Vegas Golden Knights. That number is even better considering the poor start to the season where the Boston held a 77.8% in December. Much of that can be attributed to the increase in the quality of play these guys have had. The line isn’t just good at keeping goals out of the B’s net, they have generated a lot of offense despite starting in the defensive zone over 67% of the time. The offensive leader of the bunch is Sean Kuraly, who’s having an impressive breakout season. His 17 points in 63 games put him on pace for 22 points, which is incredible from a 4th liner. Not far behind that is FA signing Chris Wagner, who is also having a break-out year, leading the line in goals with nine with another seven points on top of that. Noel Acciari certainly isn’t as offensively gifted as the other two, but still has a modest eight points in 55 games. The Merlot Line proved that having a great 4th line is pivotal to a long playoff run. We even saw this as recent as last season where 4th liner for the Capitals, Devante Smith-Pelly, scored seven huge goals in the playoffs, three coming in the finals to lead Washington to it’s first ever Stanley Cup. Now we wait and see if the “WAK” line has what it takes to go down in Boston history with a Stanley Cup victory. Did the Bruins Give up on Ryan Donato too Early? With the trading frenzy over, one of the Bruins’ new toys is Weymouth native Charlie Coyle. Now without getting too into the trade, I think the Coyle is a good fit with the Bruins; he checks a lot of boxes that Boston needs. He can play center and wing, he plays a heavy game, he’s still young at 26 and on a good contract for another year. Getting a quality player like Coyle comes with a price, and that price for the Bruins ended up being the young Ryan Donato. Now while I like the acquisition of Coyle, I don’t like how early they gave up on Ryan Donato. Obviously, he’s far from a perfect player, but I really think he has what it takes to be a successful forward in the NHL. Donato has clearly shown what he can do when he’s on his game. In the 2018 Winter Olympics, the 2014 2nd rounder averaged a goal-per-game in the five games he played overseas. In college, he was an incredible player and ended up being a Hobey Baker nominee at Harvard. Even in his first 12 games in the NHL, he had 5 goals and 9 points. Not too shabby. Entering his first full season in the pros, there was a lot expected of Donato. Coming off of a year full of accomplishments, the 22-year-old did not impress. After 11 games and just one goal, Donato was sent down to Providence. After his month stint in the AHL, Donato was recalled, and it was clear the time in the minors helped him. He was a lot stronger on the puck, and his confidence started to emerge yet again. He was still inconsistent but still, put together a string of really good games. In the end, the Bruins front-office decided it was more beneficial for Donato to continue his growth in the AHL. In Boston, Donato really never had a real shot to prove himself. Earlier in the season when the B’s needed some more depth scoring, I brought up the idea to split up the first line and put either Danton Heinen or Donato for a chance to showcase their skills with two. After a great rookie season, Heinen struggled to find the score sheet earlier this year. Similar to Donato, Heinen was still playing solid hockey (notably a better two-way game), but nothing was working for him. Much of that can be attributed to the revolving door of 3rd liners he was playing with. Obviously, the Bruins ended up giving Heinen a shot on the 1st line, and the experiment ended up being a great idea. Heinen has now found his game and (before his injury) Pastrnak elevated the 2nd line’s play; the Bs started to look like a real force in the league again. Speaking of Pastrnak, he’s another player that followed similar footsteps as Donato had. Pastrnak’s first two seasons were filled with inconsistencies. There was no questioning his skill, but he was really shaky defensively and clearly needed to get a lot stronger. In the 2016 offseason, his second offseason with the Bruins, Pasta bulked up and definitely grew as a player. The next season, he got his chance with Bergeron and Marchand on the top line, and we all know how that ended up working out. Another player I tend to compare Donato to is former Bruin, Frank Vatrano. He’s another local kid that plays a very similar style. The two are both relatively small, agile players that rely on their great shot to elevate their game. Now Vatrano wasn’t a great Bruin by any means, but similar to Donato, he showed a ton of potential. In the AHL he scored 36 goals in just as many games in the 2015-16 season. Last year, after a tough start with the Bruins, Vatrano was traded to the Florida Panthers for a 3rd round pick. Now that he’s gotten a legitimate shot with legitimate linemates, Vatrano has a chance to hit the 30 goal mark this year. Prospects TAKE TIME. Not every 21-year-old is going to light up the league in his first full season. Last season at around this time, everyone was clambering over how amazing Ryan Donato was going to be. Now that he hasn’t blown anyone away in his first true season with the big club, he gets traded. The kid is still only 22 years old. I’m not saying he would’ve been a 40 goal scorer just because he got a chance on the top line, but it was definitely worth a shot this season, or even next year after he gets stronger and grows as a player even more over the offseason. Maybe Donato never fit into the Bruin’s future, but at the end of the day, trading him now is NOT capitalizing on his value. The Bruins just gave up too early on him. Could The Bruins Have Matched An Offer On Stone? The prize of the NHL trade deadline has been dealt. 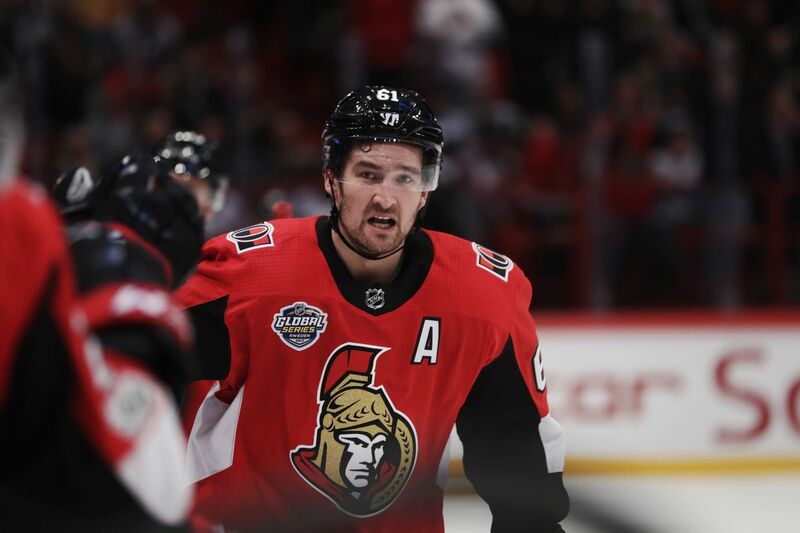 Mark Stone ends up in Las Vegas with the Golden Knights. The cost? Erik Brannstrom, Oscar Lindberg and a 2020 2nd round pick. Stone is well-regarded as one of the best two-way wingers in the entire league and is still just 26 years old. This season he has already set a career high in goals (28) and is two points away from his career high of 64. Another major factor about Stone is the fact that, soon after the trade went through, he signed an eight-year extension worth $9.5 million annually. The main piece the Senators got in return was 19-year-old defenseman Erik Brannstrom. Brannstrom was drafted 15th overall in 2017 and is widely considered as an A+ level prospect. The general consensus during “TSN Tradecentre” was that Brannstrom is easily a top-ten prospect in the league right now. The young Swede has played well in his first season in North America, totaling 28 points in 41 games in the AHL as a D-man. The year prior, he posted 15 points in 44 games playing as a kid against men in the SHL. Brannstrom has also had a lot of international success. Last year, he was paired with phenom Rasmus Dahlin on Sweden’s World Junior team and was a big reason why the team got to the finals. This past World Juniors, he led the Swedes in goals with four. While the comparisons to Erik Karlsson may be a bit far-fetched, there’s no question Brannstrom will develop into a great NHLer when the time comes. The only other player Vegas gave up was forward Oscar Lindberg. Lindberg hasn’t quite replicated his successful rookie season with the New York Rangers where he tallied 13 goals and 28 points in 68 games but has been a reliable two-way forward since then. At 27, he still has time to grow into a better player. A lot of Bruins’ fans were salivating at the potential of Stone being in the black and gold, and there’s no doubting he would be a perfect fit for Boston, but the biggest problem was clearly the price. Seeing what Stone was able to get in return, what would be a similar return from the Bruins? Despite having a great farm system, the Bruins don’t tout an A+ prospect like Brannstrom. The closest player to would be fellow 2017 1st rounder, Urho Vaakanainen. While Vaakanainen doesn’t have the offensive pedigree that Erik has, he is still a highly touted two-way defenseman with a ton of upside. When Vaakanainen was drafted, Jamie Langenbrunner, Boston’s player development coordinator, had a lot to say about the young Fin. “I think Scott mentioned to me … which I thought was high praise for a guy that could effortlessly skate around the rink,” Langenbrunner said. “[Vaakanainen] seems to have a little bit of those tendencies that he kind of floats on his skates a little bit, and it’s something that I don’t believe you can really teach.” Any comparison to a Hall-of-Famer is a good thing. The Bruins clearly think highly of the 20-year-old. When the Bruins D-core was riddled with injuries, the Bruins decided to call up Vaakainanen despite being just 19 at the time and within his first season in North America. Unfortunately, we didn’t get to see much of the defenseman as he suffered a concussion in just his second game in the NHL. When healthy. Vaakanainen went on to win the gold medal in this year’s World Juniors, tallying four assists in seven games with a +5 rating for team Finland. Since Vaakanainen isn’t quite the player that Brannstrom projects to be, you’d think a pick would need to be added to even out their hypothetical values there. Maybe exchanging the 2nd rounder that Vegas gave up for a 1st and adding a lower pick, let’s say a 4th. So at this point, the deal is Stone for Vaakanainen, a 1st round pick, and a 4th round pick. I’m sure Ottawa wanted a roster player in return, preferably a younger player with a bit of room to grow (just as Oscar Lindberg was), so maybe a guy like Peter Cehlarik would also go the other way. Cehlarik, 23, is a smart player with a great work ethic; however, he doesn’t have a massive ceiling. With that said, he has shown quite a bit of promise throughout his brief stint in the NHL. This season, he has four goals and six points in his 14 games with Boston. So would a realistic offer for Mark Stone be Urho Vaakanainen, a 2020 1st, 2019 4th, and Peter Cehlarik? I’d say it’s pretty similar in value to what Vegas gave up, but I’m not sure either team would end up doing it. According to @BruinsNetwork on twitter, it was what Vegas offered, not what the Bruins didn’t in regards to Stone so maybe he was destined to never be a Bruin.